South African species L-M are found on this wiki page. 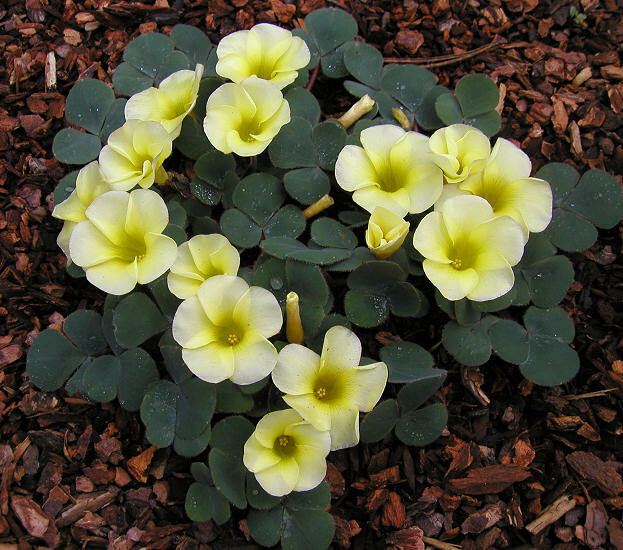 Oxalis lawsonii is another summer growing Oxalis, flowering in the latter half of the season. It occurs over the larger part of the southern African interior, and has been recorded in Namibia, Botswana, and South Africa. 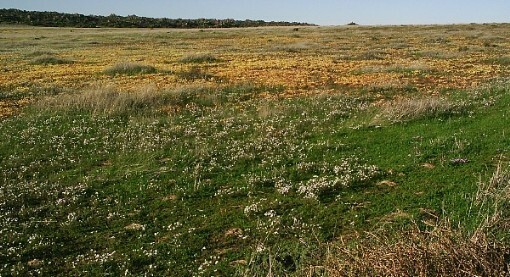 The first two pictures are of plants in habitat near Griekwastad, the other two of plants from Ditshipeng, north-east of Kuruman. Note the difference in flower colour and form between the two collections. 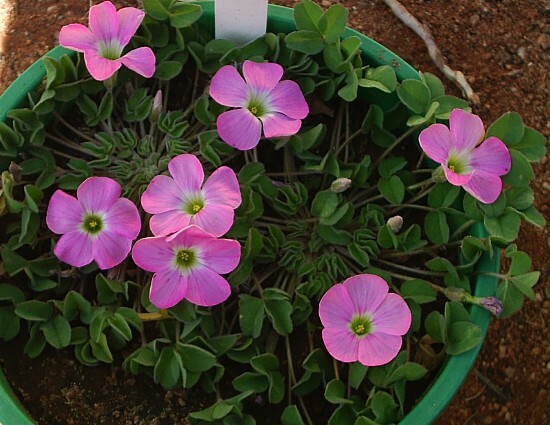 The flowers are normally rosy-pink, but a few specimens with red flowers have been seen at Griekwastad. Photos by Christiaan van Schalkwyk. 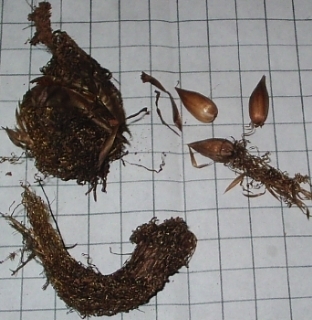 The bulbs have an outer layer of undulated and interwoven tunics, and a thin light brown inner tunic. 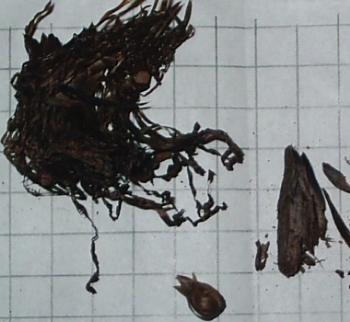 The bulbs were photographed on a 1 cm square grid, and show a set of bulbs in their outer tunics, a bulb with the outer tunic opened up and the bulb removed, and lastly the collection from Ditshipeng, which have a much darker and less undulated outer tunic. Photos by Christiaan van Schalkwyk. 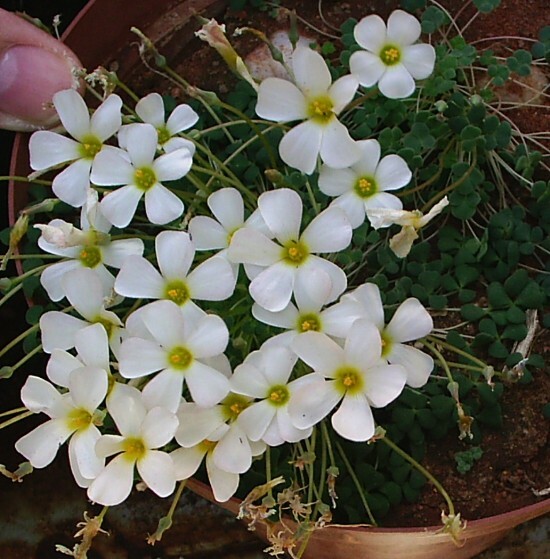 Oxalis lichenoides is dwarf, stemless and semi-succulent. 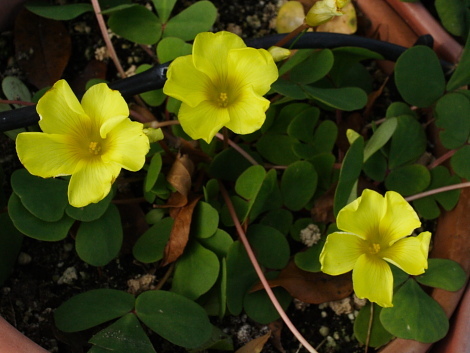 All three photos are from the same pot of plants; the third photo was taken two years after the first, and shows what regular watering and feeding can do to even the small Oxalis species. 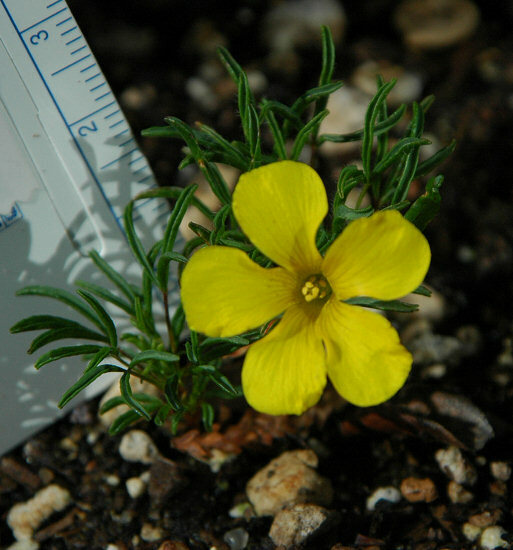 It is interesting to note that even though the plants are much bigger and more robust, the flower size remains the same. 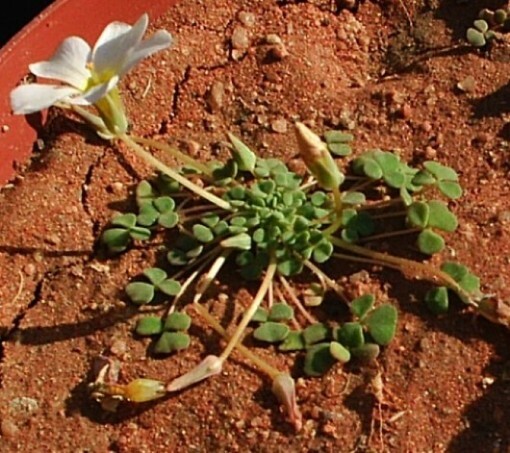 This species are found around Vanrhynsdorp and Kamiesberg, although I suspect its distribution range could be much bigger, as plants do not appear every year and are extremely difficult to spot, even when in flower. Photos by Christiaan van Schalkwyk. 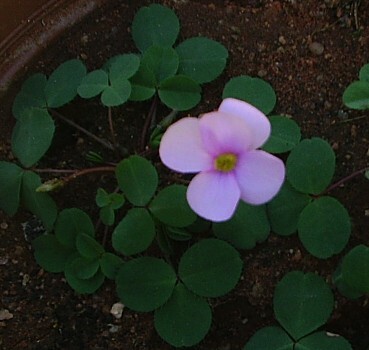 Oxalis livida has trifoliolate leaves, usually hairy, with deeply bilobed leaflets that are purple beneath and rose or lilac flowers with a yellow tube. It blooms in fall. 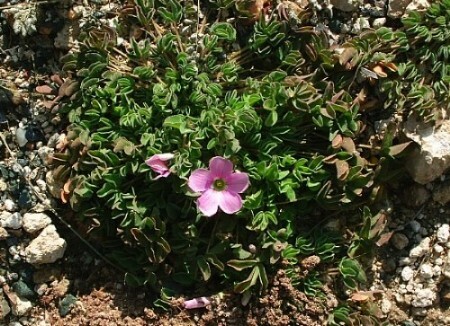 It is found on rocky slopes in shade in the Northwest and Southwest Cape. 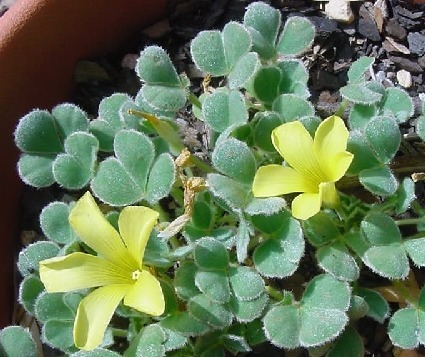 Plants are shy to bloom but has attractive leaves. 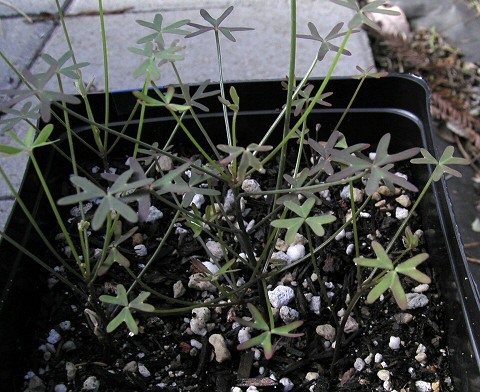 Photos 1-3 were taken by Mary Sue Ittner of Oxalis sp. Uli76 collected by Johannes-Ulrich Urban at about 500 m on the Nieuwoudtville Pass in fynbos habitat. 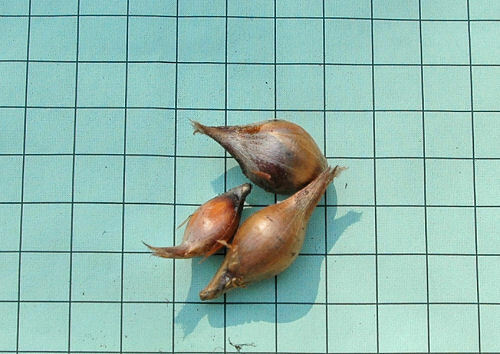 Photo 3 shows the bulbs on a 1 cm grid. 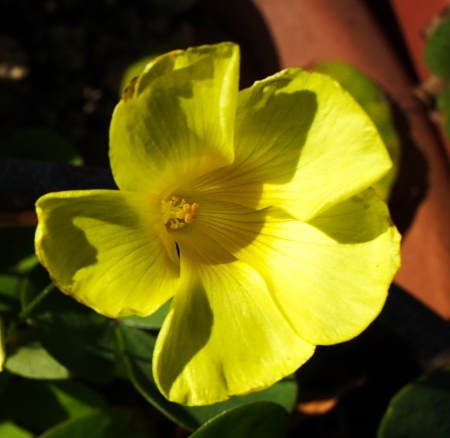 Photo 4 by Nhu Nguyen of the same clone shows the flower with a very flat plane. 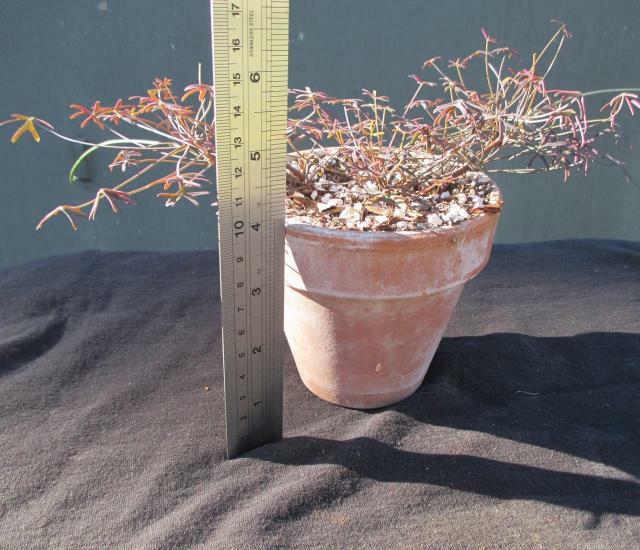 M. Gastil-Buhl received bulbs of this clone via PBS BX 318 and grew them in full sun in an open basket the first year where they did not thrive but did multiply, then in a small terracotta pot in partial shade the second year where they are growing well as shown in photos 5 and 6. 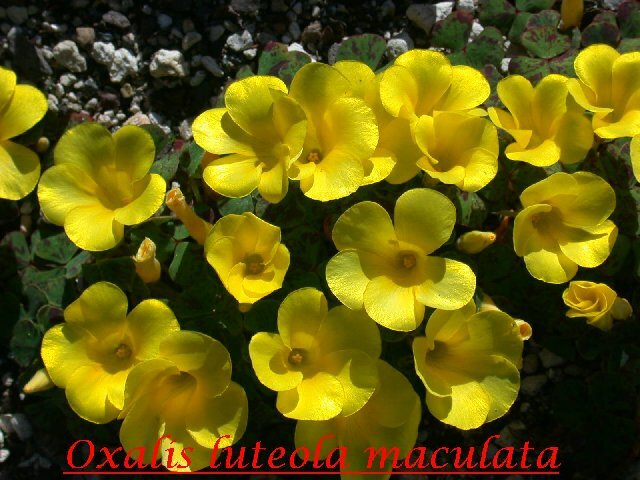 Oxalis luteola, is a species with large gummy bulbs, trifoliolate leaves which are often purple beneath and yellow flowers. It is found on flats and lower slopes blooming fall to winter. 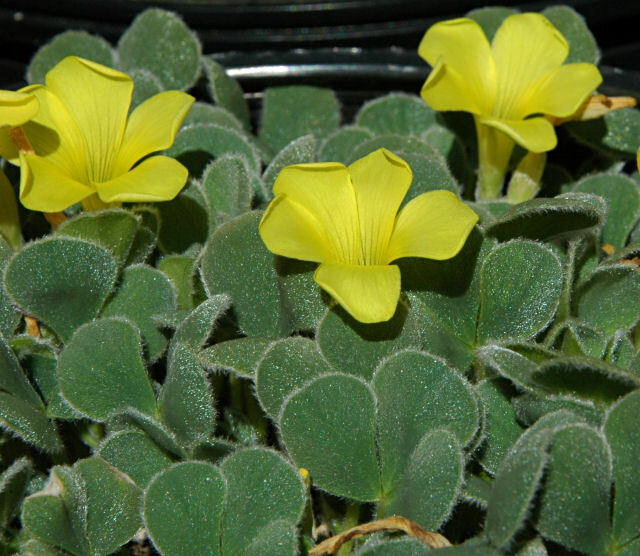 Oxalis luteola MV4960B A robust plant with intense yellow flowers. Collected by Michael Vassar "20km southeast of Sutherland, on a north facing gravel hill." 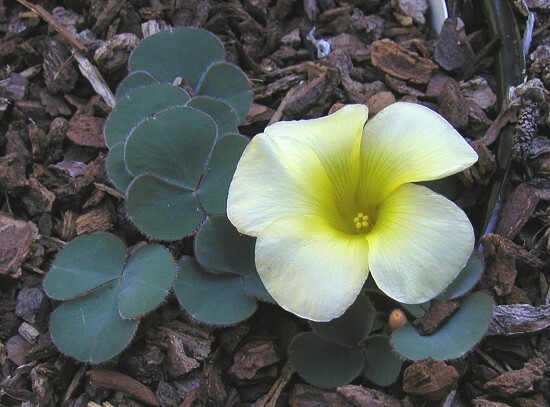 He listed this as probably O. luteola, but noted that the bulbs did not fully match the species description. Photos by Michael Mace. Oxalis luteola MV5567 This Oxalis was collected by Michael Vassar 60 km. 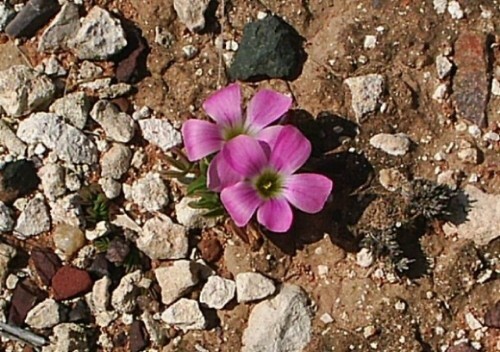 from Clanwilliam (northwest Cape, South Africa.) 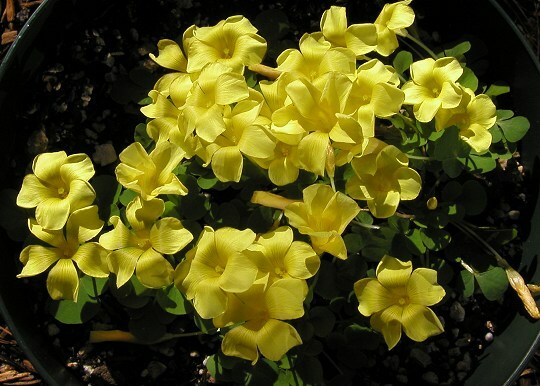 It has light yellow flowers with a darker center and has been a very reliable bloomer for me blooming between November and January each year in California. Photos by Mary Sue Ittner. 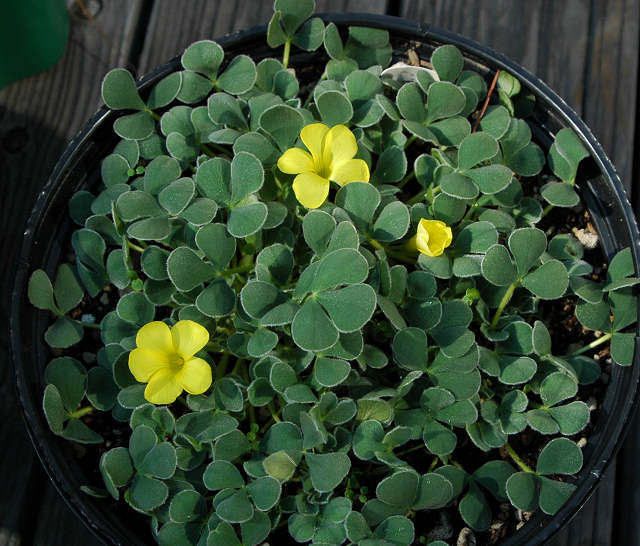 Oxalis luteola MV6395 is a selection of Michael Vassar's from the Gifberg with bright yellow flowers and tight growth. It was one of his favorites. Photo 1 by Bob Rutemoeller and photo 2 by Kristina Van Wert. 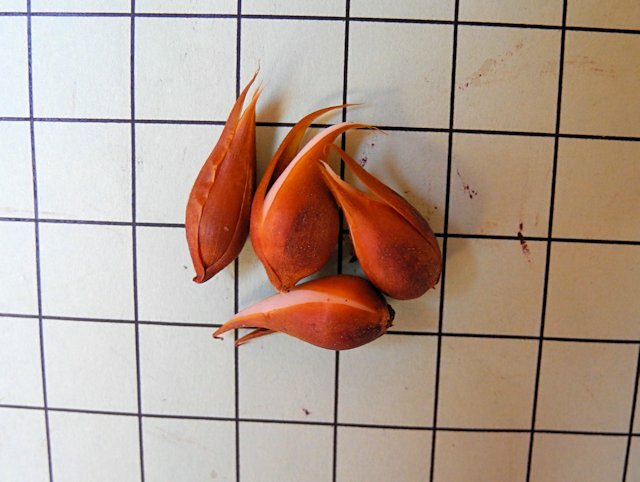 The last photo from Mary Sue Ittner shows the bulbs on a 1 cm grid. 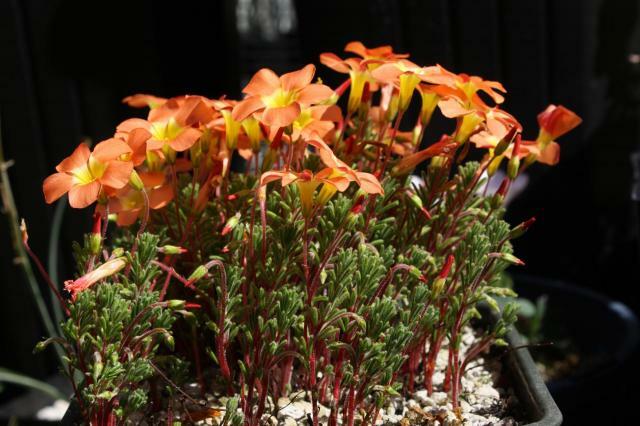 This plant given me by Johannes-Ulrich Urban is slower to increase than some forms of Oxalis luteola. 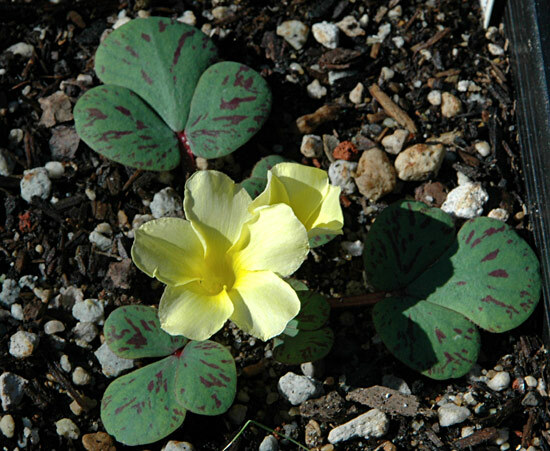 It has yellow flowers, blooms late fall and has attractive speckled leaves. 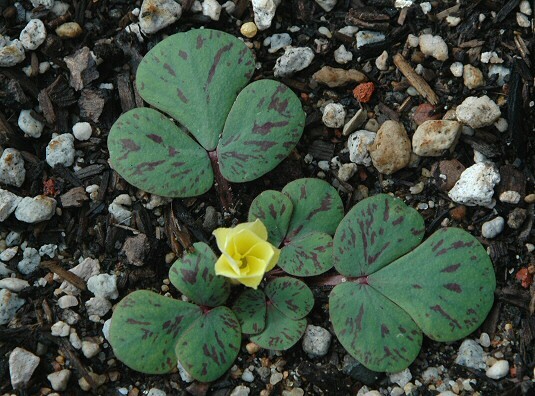 The consensus is that it is a form of Oxalis luteola similar to the form shown by Bill Dijk below which also has spotted leaves. Photos by Mary Sue Ittner. 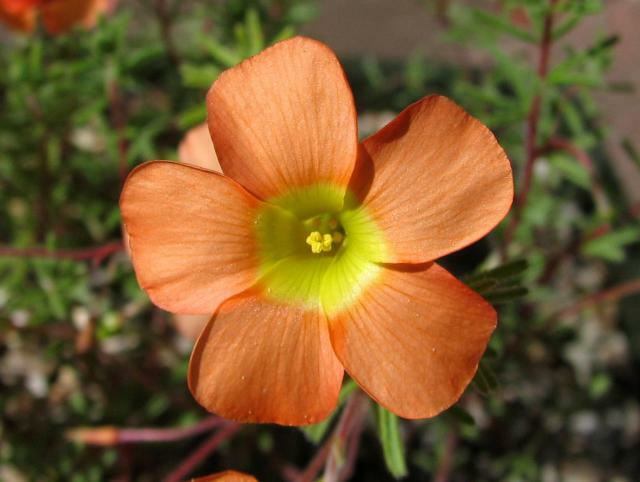 Oxalis massoniana is a beautiful low growing Oxalis from South Africa with orange flowers that blooms in the fall. 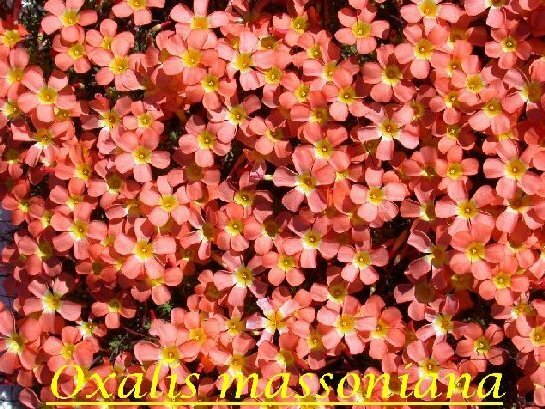 This plant blooms profusely for a long time and when there are enough bulbs in a pot, it makes a wonderful show as seen in the photos below. Photo 1 was taken by Bob Rutemoeller, photo 2 by Bill Dijk, and photos 3-5 by Nhu Nguyen. 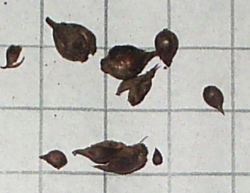 Photo 6 by Mary Sue Ittner shows the small bulbs on a 1 cm grid. 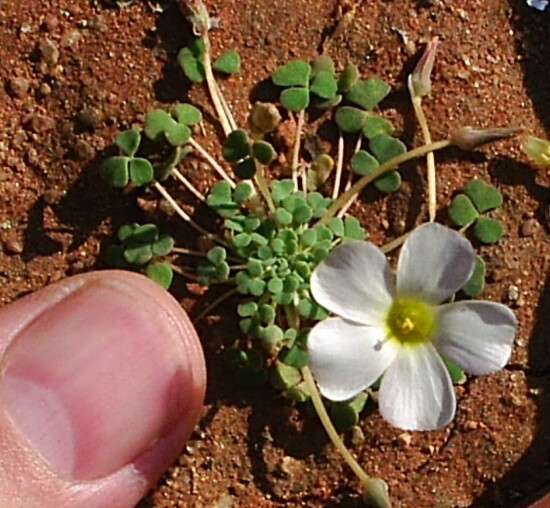 Oxalis massoniana in flower near Nieuwoudtville, South Africa. 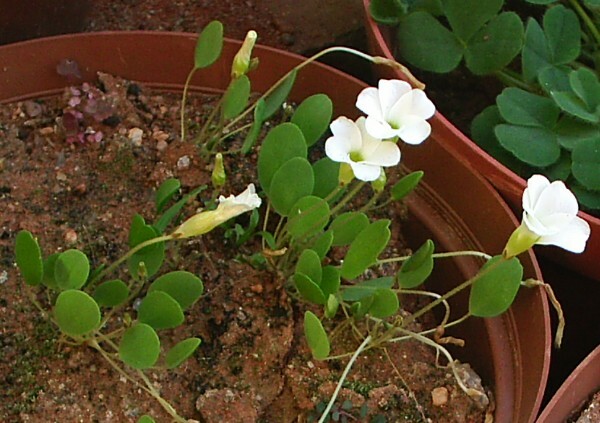 Associated species include O. flava (white), and O. callosa. Photo by Christiaan van Schalkwyk. 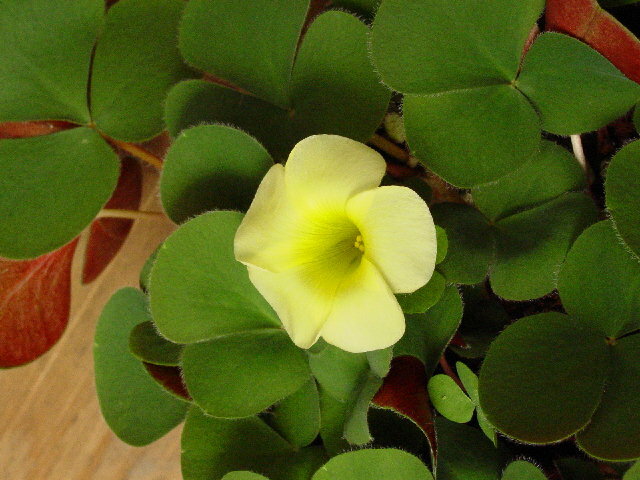 Oxalis melanosticta commonly grown under the name Oxalis purpurea 'Ken Aslet', is grown mainly for its velvety foliage but does produce yellow blooms. Some clones flower more than others. 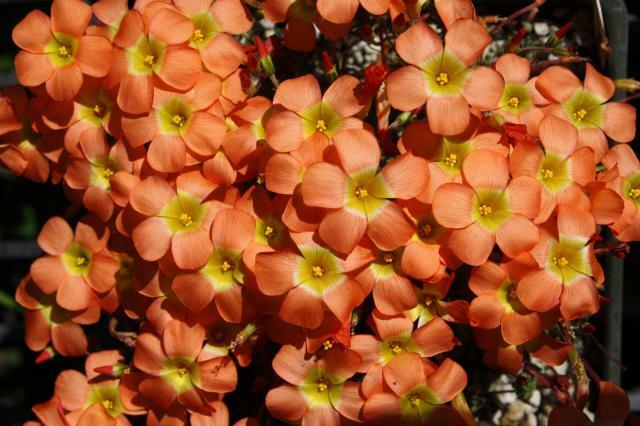 This particular species grows on dry mountain slopes from the Bokkeveld Escarpment in the northwestern Cape to the Western Karoo and Montagu. Photo #1 by Lyn Edwards. Photos 2-5 from Mary Sue Ittner who for years grew this in Northern California without seeing blooms and assumed she had a non blooming clone. 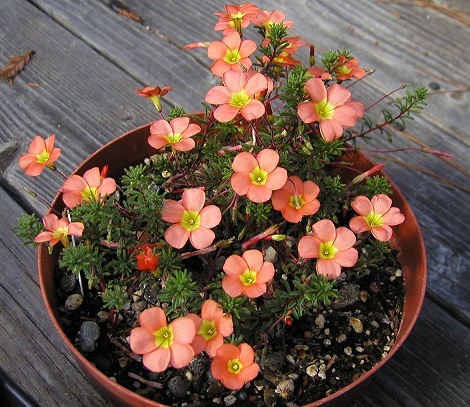 But since she has been growing it in a larger and deeper pot and starting to water it in late summer so it will start in growth before it starts raining in Northern California, it has been blooming well. 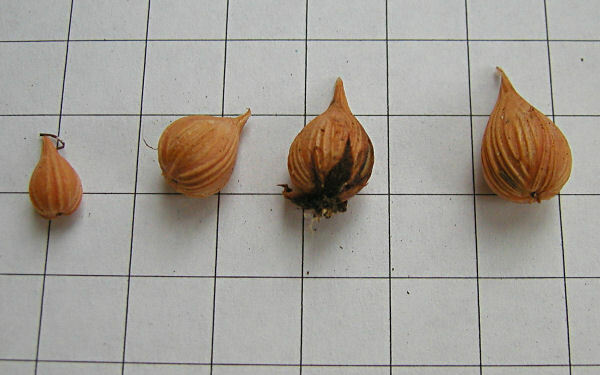 The last photo shows the bulbs on a 1 cm grid. 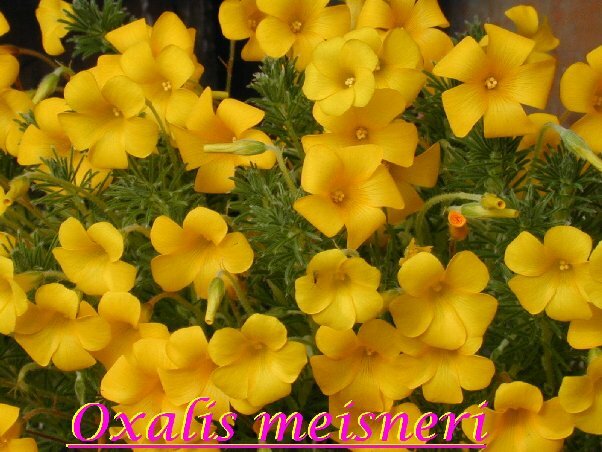 Oxalis meisneri is from the northwest Cape and has trifoliolate leaves and yellow or lilac flowers. It blooms fall to winter. Photos from Bill Dijk and Mary Sue Ittner. 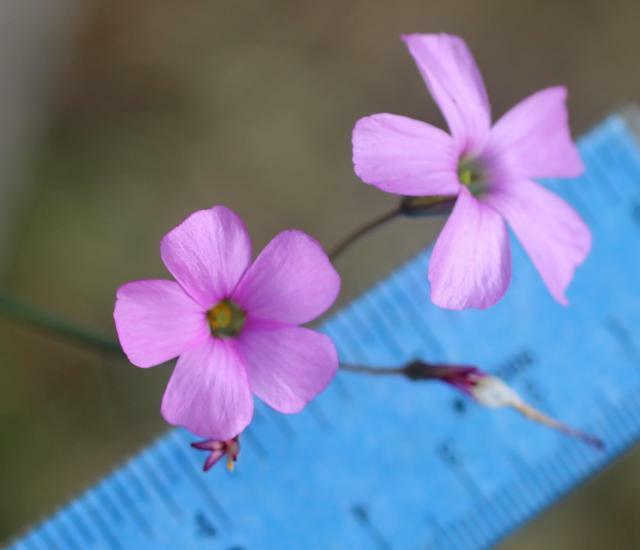 The last photo has a metric ruler to show how short this plant is. 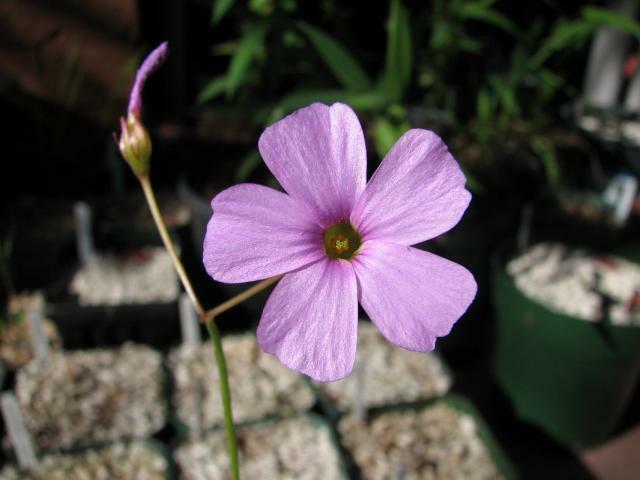 Oxalis minuta is a small stemless plant. 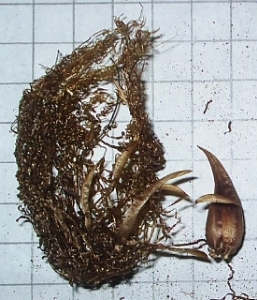 The leaflets often have hairs on the margins and medial nerve beneath. 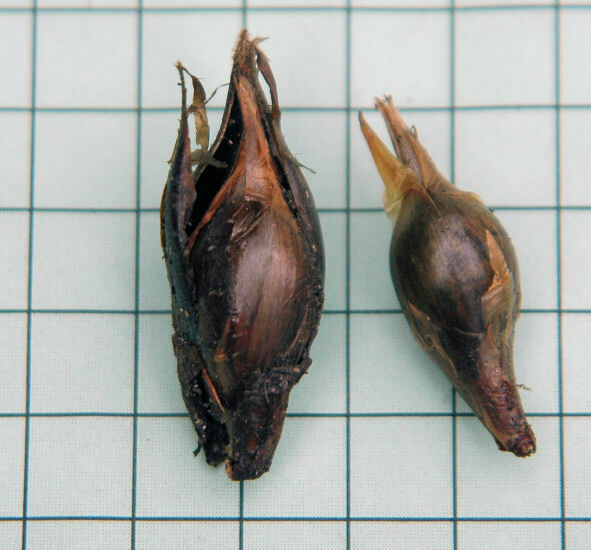 The bulbs are small, ovoid, and pointed at the apex, with soft brown tunics. The grid is 1 cm. square. Photos by Christiaan van Schalkwyk. 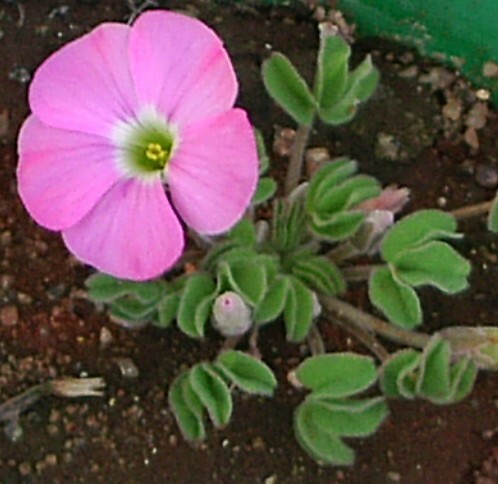 Oxalis monophylla is a small species with one leaflet per peduncle. 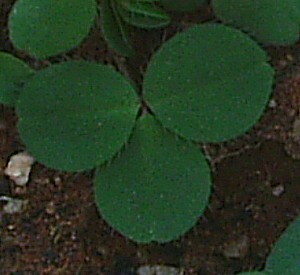 Various shaped leaves can be found, from nearly round (var. rotundifolia) to lanceolate. 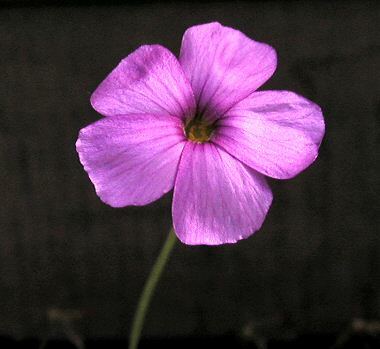 Flowers are pale rosy-violet or white. Photo by Christiaan van Schalkwyk.